The groundbreaking exhibition Remembering Our Indian School Days: The Boarding School Experience draws on first-person recollections, memorabilia and the writings and art of four generations of Indian school alumni to examine the commonality of the boarding school experience. A powerful display that explores an important era in American history, the exhibition incorporates historic images, music, sound, oral histories, memorabilia and video to immerse visitors in the story being told by the people who lived it. 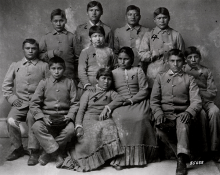 Federally run Indian boarding schools became a key element of the widespread national effort to “Americanize” American Indians beginning in the late 19th century. The BIA’s first official boarding school, Carlisle Indian School, was established in 1879 in Carlisle, Penn. Because a comprehensive listing has never been created, the actual number of Indian boarding schools is unknown. The number of Indian boarding schools established since 1879 is estimated to be in the hundreds. Today, four BIA boarding schools – Chemawa Indian School at Forest Grove, Ore., Sherman Indian School at Riverside, Calif., Flandreau Indian School at Flandreau, S.D., and Riverside Indian School at Anadarko, Okla. – are currently in use. Indian boarding schools have operated parallel to the mainstream education system historically. Curriculums changed emphases according to the changes in mainstream curricula, emphasizing agriculture from 1879 to 1910, vocational education from 1910 to 1960, academia from 1960 to 1990, and reform and college preparation in the 1990s. Cultural programming generally was limited until the 1960s, when many tribes began to oversee the schools. The primary difference between Indian boarding schools and the mainstream education systems was segregation. Historically, only two groups – African Americans and American Indians – were segregated from mainstream education systems. African Americans were integrated with the Civil Rights Movement. Today, American Indians continue to be segregated from mainstream education systems, reinforcing misunderstanding and stereotypes. Remembering Our Indian School Days breaks down the walls of misunderstanding by presenting the common experiences of the American education system. Boarding schools separated children from their families and tribal cultures and required conformity to Euro-American society. 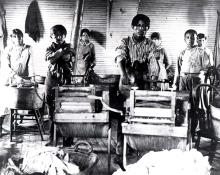 The boarding school experience thrust Native children into an unfamiliar environment. Children were abruptly taken from their families and homes and placed in government-run boarding schools around the country. Conversing in one’s Native language was strictly forbidden, and students were required to wear standard-issue Euro-American clothing. Many students who arrived at the schools with long hair, which is spiritually symbolic for many Native cultures, received haircuts immediately following their arrival. Traditionally an act associated with special ceremonies, hair cutting became one of the most immediate and devastating experiences of boarding school life for American Indians. The wearing of long hair has served as a strong symbol of personal identity throughout the boarding school history. 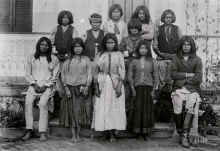 Although initially operated from a fundamentally Anglo-European structure, Indian boarding schools evolved with a national American Indian identity. Sports, music and arts programs provided students with an important means of achieving competency in a world previously unfamiliar. The students’ successes in these programs became a source of pride not only for the students but also for the community as a whole. Carlisle Indian School student Louis Tewanima (Hopi) is one such example of the students’ individual and collective successes. Tewanima, a silver medalist in the 1912 Olympics, is remembered every Labor Day weekend at Shungopavi, Ariz., where a race is run in his honor. The event attracts runners from across the nation. His classmate and acclaimed Olympic athlete Jim Thorpe (Sac and Fox), was a football star at Carlisle Indian School. Remembering Our Indian School Days incorporates a variety of audio and atmospheric elements to immerse visitors in the experience of Indian boarding schools. Each of the exhibition’s 10 sections is constructed to emulate different boarding school experiences and environments, from the arrival to classrooms and dorm rooms. Hands-on stations are also present throughout the exhibit, enabling visitors to interact with the exhibition. Remembering Our Indian School Days: The Boarding School Experience is generously supported by the National Endowment for the Humanities, with additional support from The Rockefeller Foundation, The Arizona Republic, Bank of America, Intel Corporation, Mr. & Mrs. William Freeman, Mr. & Mrs. Fred Lynn and the Roger S. Firestone Foundation. Chiricahua Apache children upon arrival at Carlisle Indian Industrial School from Fort Marion, Florida. J.N. Choate, photographer, Barry Goldwater Collection #GI-44, Arizona Historical Foundation, University Libraries, Arizona State University, Tempe, Arizona. Chiricahua Apache children four months after their arrival at Carlisle Indian Industrial School. J.N. Choate, photographer, Barry Goldwater Collection #GI-44, Arizona Historical Foundation, University Libraries, Arizona State University, Tempe, Arizona. 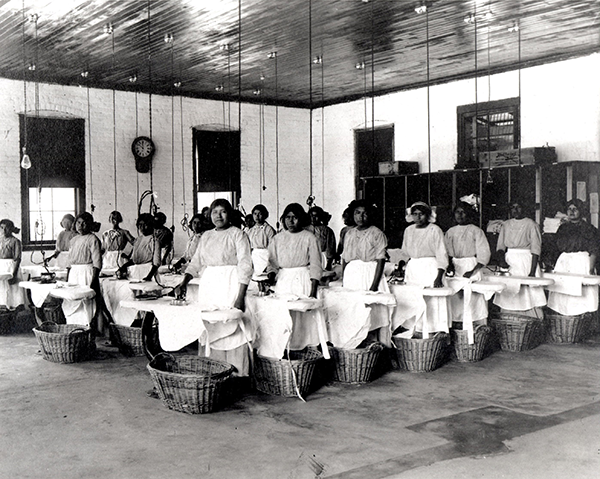 Students working in the laundry of the Riverside Indian School in 1901. Oklahoma Historical Society. 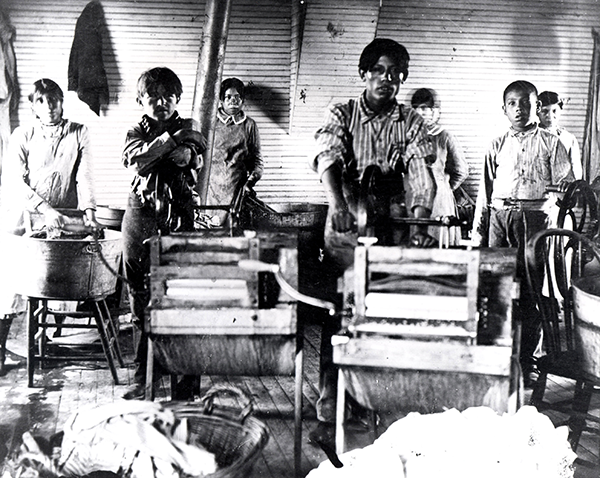 Sherman Indian School students working in the laundry in 1910. National Archives. 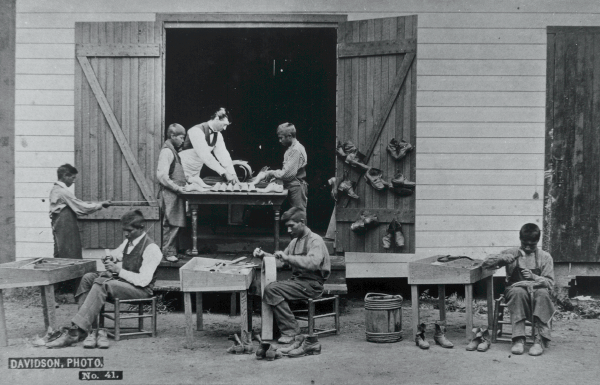 Shoemaking, Indian Training School, Forest Grove, Oregon, c. 1880. Harvey W. Scott Memorial Library, Pacific University Archives.